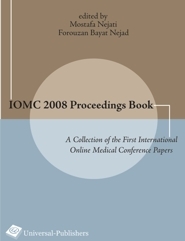 This book is a collection of the accepted papers of the 1st International Online Medical Conference (IOMC 2008). It includes the latest findings and research works of medical doctors, medical university prfessors, and activists from around the world, which covers different themes in the field of medicine. This book is suggested to all medical doctors, students, academics, professors, and researchers. The unique feature of this book is that all the articles are related to the FIRST-EVER completely held ONLINE Medical conference (IOMC 2008) which was sucessfully held on May 14 & 15, 2008. IOMC 2008 was held by International Online Knowledge Services Provider (IOKSP). IOKSP is a research-based online knowledge solution provider since 2006, which aims to enhance the science and research arena worldwide through its innovative, comprehensive, and user-friendly services. IOMC seekss to provide a forum for discussing and presenting research findings, studies, and experiences in the field of medicine, to create an opportunity for medical researchers, activists, scientists, students, and specialists to meet each other online and share their research papers, and to provide a chance to find new research colleagues and partners for future research works.